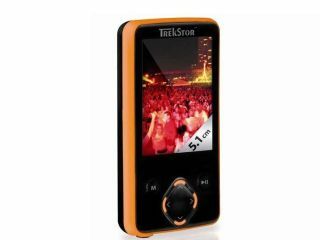 TrekStor has announced a new low-price range of MP4 players, which is sure to entice those looking to watch films on-the-go on a budget. The i.Beat Move MP4 (presumably the dot after the 'i' stops the need from any Apple-shaped lawsuits) comes in three sizes and capacities. The first size (small) measures a miniscule 38.5 x 74.5 x 9.5mm and has a screen size of 3.8cm; medium clocks in with a 4.6cm screen; while large measures 45.5 x 78 x 10mm and has a modest screen size of 5.1cm. The i.Beat has support for a majority of files: MP3, MP4, WMA, WAV and WMA-DRM9. It also supports JPEG – so you can view your photos – and AVI. Memory can be boosted with a miniSD card – there's a slot included – and when you're bored with your own movies and music, you can tune into one of the 25 preset stations on the included FM radio. For those that like their PMPs non-Apple branded, the i.Beat Move is available now from £24 for 2GB to £59 for the 8GB from Amazon and the like.